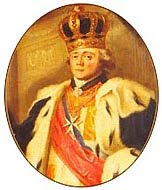 After the death of Catherine the Great, the enlightened Empress who left a remarkable trace in the history of Russia and St.Petersburg, her son, Paul I ascended the Russian throne. Although he held it for five years only, he still managed to contribute to St.Petersburg’s architecture. One of the most significant edifices he gave the city was the Mikhailovsky (now Engineering) Castle. Emperor Paul ISince it was built about two centuries ago, the castle has been shrouded by legends and rumors. Its medieval façade painted in bizarre colors and making stark contrast with the city’s classical style, and the very life of Emperor Paul I — the most enigmatic of Russian monarchs, who was brutally murdered in the castle – all this gives the place a mystical flair. 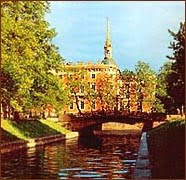 The Mikhailovsky Castle seats on the bank of two rivers – the Moika and the Fontanka – near the Summer Garden. The spot was chosen by Catherine I, the wife of Peter the Great, for her Summer Palace. Unfortunately, she didn’t live to see it finished. Construction was completed under Catherine’s successor, Empress Anna Ioannovna, who was very fond of the palace and spent most of the summer there. This may be one reason why the next Empress, Elizabeth, who hated Anna Ioannovna, ordered to tear it down and build a wooden palace instead. We can see it in old engravings – a huge opulent building with a park, terraces, fountains and a gallery leading to the Summer Garden. It was there that Catherine the Great staged an official reception after ascending the throne. There, in the Summer Palace, in 1754 she gave birth to her son and future Emperor Paul I. The palace was Paul’s abode during his childhood and early youth. There his long and nerve-racking road to power began. Having at last ascended the throne in 1796, Emperor Paul, already in his 40s, hated living in the Winter Palace where he suspected plots being hatched against him at every corner. So he made up his mind to build a new residence. Legend has it that Paul once said: “I want to die where I was born.” In 1797 the Summer Palace was dismantled and the construction of a new castle began. The first stone was laid on Saint Archangel Michael’s Day, hence the castle’s name – Mikhailovsky. Some sources claim, however, that the first-stone-laying ceremony occurred under different circumstances. A night sentry in the Summer Garden had a vision: he claimed seeing Saint Archangel Michael who told him to go the Emperor and say that the Summer Palace must be destroyed and a church in honor of Archangel Michael Mikhailovsky Castlebe constructed in its place. The soldier did as he had been told and the Emperor replied: “Let it be so” and the same day ordered to build a new palace and a church. The castle was designed by architect Vincenco Brenna invited from Italy. Construction lasted three years. On February 1, 1801, the impatient Emperor together with his wife and numerous children moved into his new residence, still damp and smelling of paint. In 1819 the Mikhailovsky Castle that stood empty for nearly two decades after Paul’s death was transferred into an engineering school.